As this year’s wedding season draws to an end, it’s highly likely that you have spent the summer months sauntering around stately homes, sipping champagne, and sporting your finest attire, whilst watching your nearest and dearest tie the knot. If only the sunshine and long nights could last forever! And, although it’s highly likely that you have had a lovely time, have you ever considered the impact attending a wedding has had on your finances? After all, with the average cost of attending a wedding increasingly rising, it’s not only the bride and groom who find themselves under increased financial pressures when their big day comes to an end. Watching your friends or family members say ‘I do’ should be a joyful and poignant occasion, with countless happy memories attached to their big day. But, for many people, wedding season is not only a source of increased financial pressure, it can also lead to domestic arguments amongst couples over the costs associated with being apart of your loved one’s wedding day. 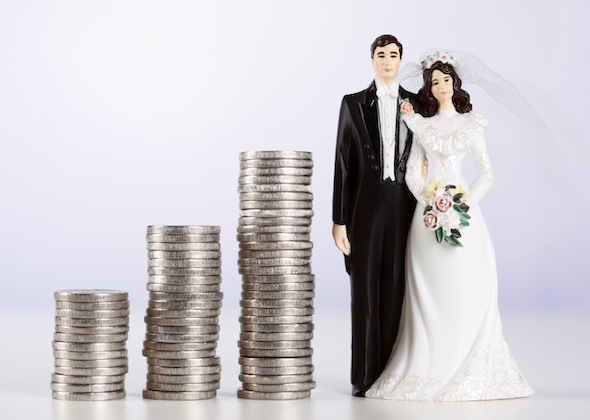 It’s hardly surprising considering that the costs associated with watching your loved ones celebrate their wedding day can often have a huge impact on your finances. From finding the spare cash to pay for suitable attire, to covering travel (sometimes abroad!) and over night stays at luxurious hotels, being part of other people’s weddings is a costly business. This said, you should never feel as though you are in a position where you need to politely decline a wedding invitation, or feel pressured to borrow money that you cannot afford to pay back. This not only takes the excitement out of being a wedding guest, it can also lead to increased financial difficulties in the future. With the cost of living continuing to increase, it’s sometimes difficult to keep track of your spending habits, especially when it always seems to be the months where we have little disposable income are the months when our social calendars skyrocket! So, in order to allocate enough money to cover personal spending such as accommodating special occasions, it’s vital that you can distinguish the difference between your regular and disposable expenses. Many couples find themselves in a position where they are not able to attend the same wedding. In cases like this, it can be helpful to create a joint account for regular expenses such as bills, food and fuel, and separate accounts for personal spending. This way, it’s easier to keep track of who’s spending what. Of course, it can also stop you from over spending in situations where you have specifically budgeted for each occasion. If you do find yourself in a position where you need to think about applying for credit in order to cover the costs of attending a wedding, it’s worthwhile checking your credit reports to see if you are likely to be accepted. There are a number of services that allow you to do this, including Experian. Discussing and managing money is renowned as being one of the biggest causes of domestic arguments amongst couples, so it’s vital that you are always open and honest when it comes to dealing with your financial past and future. Especially, if you find yourself in a situation where you both decide to apply for a credit card in order to cover the costs of attending a wedding over a longer period of time. After all, there’s no hiding away from your financial past. If you are still re-paying money that you borrowed in the past or have a less-than-perfect credit history, this could effect both of you in the long-term if your accounts become linked.